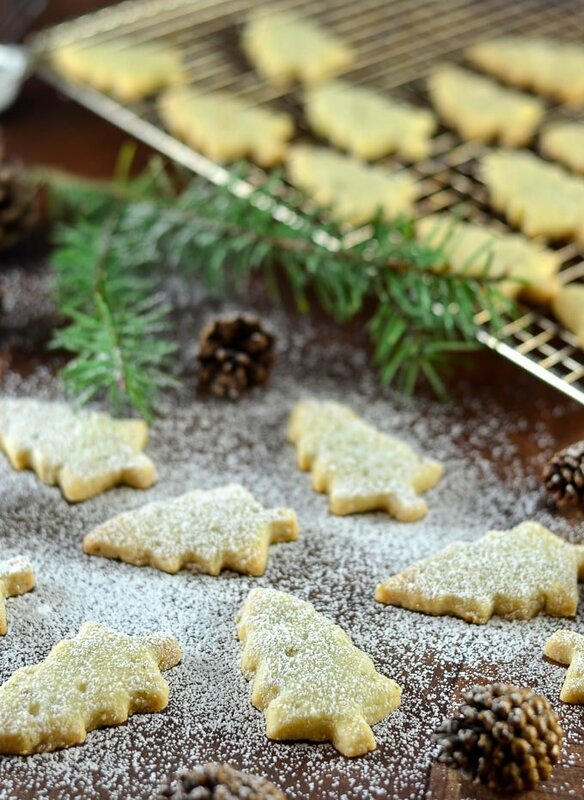 Melt in your mouth Pine Needle Shortbread Cookies. A twist on an old favourite with just a hint of piney, citrusy flavour. Delicate, delicious & sure to impress! 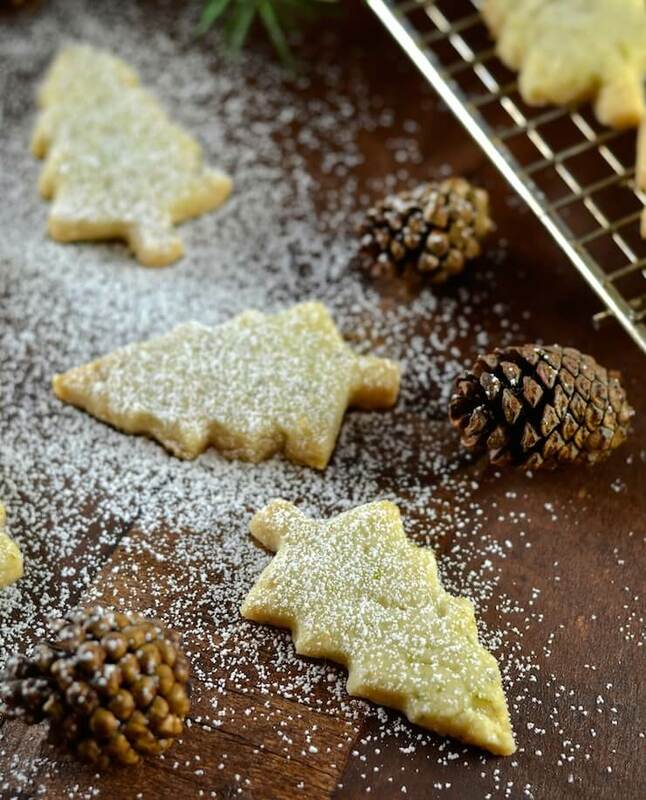 After the success of my Lemon Lavender Shortbread Cookies, I have been meaning to come up with another recipe and what better time than Christmas? I wanted it to be a festive version and had lots of different ideas, but when the smell of pine filled the house after we brought our Christmas tree home, all of those ideas fell by the wayside. 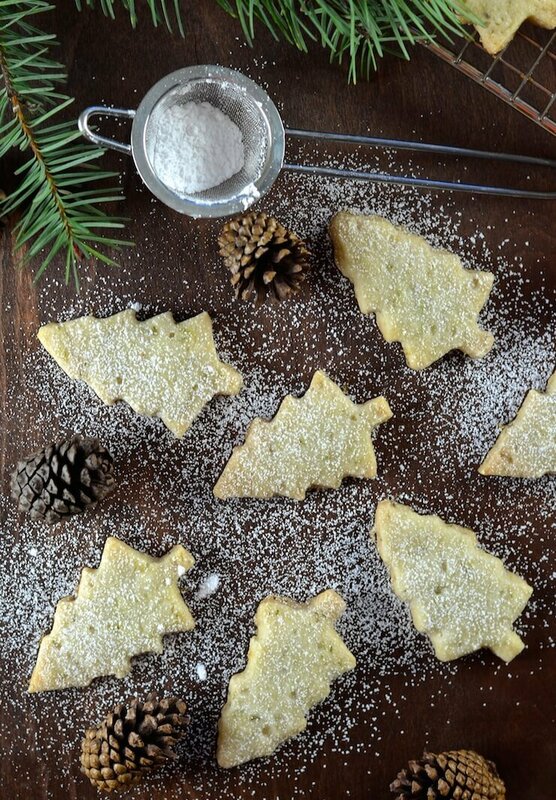 I just knew that Pine Needle Shortbread Cookies needed to happen! Did you know that pine needles are edible? * Cue a twig and leaf eating vegan joke…..I walked straight into that didn’t I? I vaguely remember years and years ago, drinking pine needle tea, somewhere, I have no idea where. That is how I knew that you could eat/drink them. They are incredibly nutritious too, containing more vitamin C than lemon and high levels of vitamin A and other antioxidants. I am not usually much of a forager, but as far as I know you can’t buy pine needles for cooking anywhere? As I live in Canada, I am surrounded by more pine trees that you can imagine so sourcing them is easy. In fact they are pretty common wherever you are, so you shouldn’t have much of a problem finding a willing donor at all. Be sure to choose needles that aren’t on branches really low to the ground as they might have been peed on by dogs or other passing creatures ??? ?, and be sure to choose trees which you know would not have been sprayed with anything nasty. I would also recommend not using needles from your Christmas tree or wreath as they are often sprayed with pesticides or flame retardant prior to harvesting. Choose a ‘wild’ tree away from busy roads and I would recommend tasting the needles (yes I was the mad woman in the forest tasting the trees ????). They all taste really different. Firs and spruces tend to have the best flavour and are the most fragrant and citrusy which works really well in my Pine Needle Shortbread Cookies. These cookies are so easy to make. You need no special equipment at all. Just a bowl, a fork and a baking tray. A cookie cutter is nice to use but if you don’t have one the top of a mason jar or the rim of a cup or glass does the job too. A Christmas tree shaped cookie cutter is perfectly suited to the pine needle flavour though and they look so pretty! 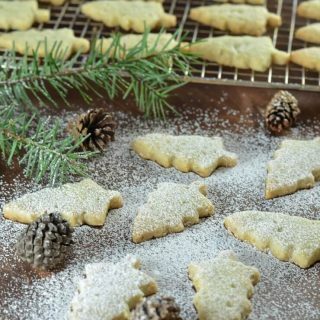 Shortbread always makes a welcome gift, and these Pine Needle Shortbread Cookies are just perfect for gifting this holiday season. Festive tins are easy to come by and perfect for packing them up in (check out your local Dollar Store as they usually have some). These little self adhesive gift bags are also a cute idea. Other gift-able ideas that you can find here on AVV are my Festive Vegan Mincemeat, my Mint Chocolate Truffle Larabar Bites, and my gorgeous Raw Christmas Fruit Cake. Cookie swaps are something new to me but they seem to be something that happens pretty frequently here in Canada and the U.S. 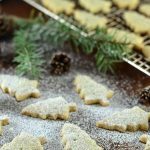 I had never heard of them until I moved here but the whole cookie swappage thing sounds great to me and these Pine Needle Shortbread Cookies would be very swappable! *I did my research before developing my recipe and all varieties of pine needle are edible except Norfolk Island Pine, Ponderous Pine and Yew trees. They are easy to distinguish as their foliage is different to other pine trees. Norfolk Island Pine doesn’t really have needles at all, it’s foliage is more like fronds or fern leaves. Yew trees have flat, wide needles that aren’t sharp and they have red berries instead of pine cones and Ponderous Pine has very long, 4″ – 12″ long needles which because of their length makes the foliage look like fox tails. Avoid these varieties and be sure to stick to the traditional, short, cylindrical, pointy needles. The younger needles are best as they are more tender although they soften up when you cook them so don’t worry to much about that. 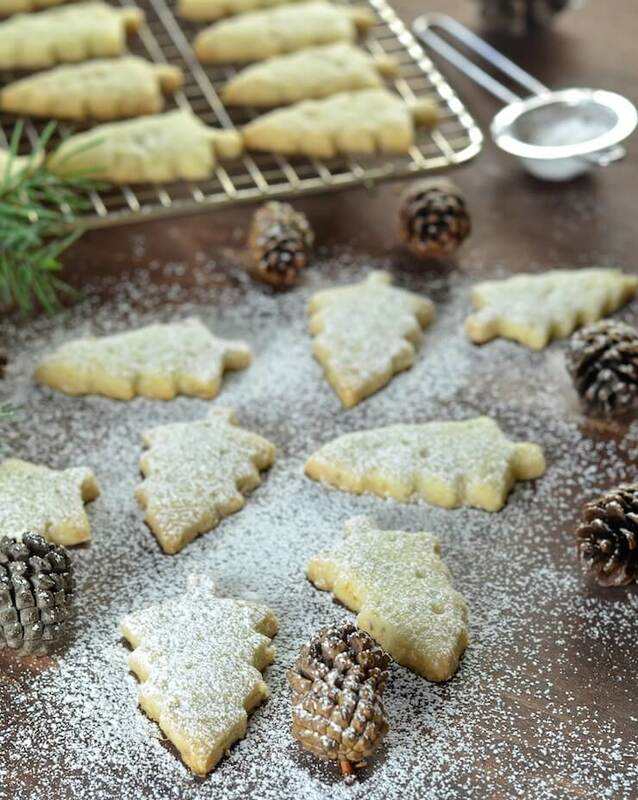 If you make some Pine Needle Shortbread Cookies, be a ☆ and let me know what you think in the comments below! You can also share a pic on Instagram. I am @avirtualvegan and if you use the hashtag #avirtualvegan it will make doubly sure I don’t miss it. Preheat oven to 350°F and get a cookie sheet ready. If your sheet has a tendency to stick then line it with parchment paper or a silicone mat . Put the flour and pine needles in a blender. Make sure the top is on tight and blend until the pine needles are chopped into little pieces throughout the flour. Don't be alarmed by the really strong pine smell. Once cooked it becomes very subtle. Using a blender is the easiest method for chopping the pine needles. You need the flour in there with them as otherwise it's such a tiny amount they would just fly around and not get cut. I found chopping the needles with a knife pretty tough (literally!). Scissors would be a better option if you don't have a blender. Combine the powdered sugar, salt and the coconut oil in a bowl. Use a fork to mash together very, very well until you can no longer see any powdered sugar and it's light and fluffy. Pour in the flour and pine needle mixture and mix by hand until everything is combined. I start by mashing with a fork then stir together with a spoon at the end a bit. Do not over mix or use electric beaters here. Too much mixing will affect the texture of the finished shortbread. When done it should be slightly crumbly but hold together if you squeeze it together in your hand. The drier you can get away with keeping the dough, the better the texture of your shortbread and you should not need to add any liquid at all. If the dough is starting to get a bit soft, stop and put it in the fridge for 20 minutes before continuing. It will firm up again then. Lightly dust a surface with flour and shape your dough into a ball. Roll out to about 3 - 4 mm thick then use a cookie cutter or mason jar lid/rim of a glass to cut into shapes. Place gently on the prepared cookie sheet. Bake for 10 - 12 minutes.They will start turning a little golden around the edges and on the bottom when done. Keep an eye on them in the last few minutes as they can turn from ok to overdone very quickly. They will still feel slightly soft in the middle but will firm up as they cool. Place them on a cooling rack to cool. Unlike some cookies these are best eaten when completely cooled so be patient! I like a very slight salty edge in these cookies so used half a teaspoon of salt. If you are sensitive to salty flavours then just use 1/4 teaspoon. I did my research before developing my recipe and all varieties of pine needle are edible except Norfolk Island Pine, Ponderous Pine and Yew trees. They are easy to distinguish as their foliage is different to other pine trees. Norfolk Island Pine doesn't really have needles at all, it's foliage is more like fronds or fern leaves. Yew trees have flat, wide needles that aren't sharp and they have red berries instead of pine cones and Ponderous Pine has very long, 4" - 12" long needles which because of their length makes the foliage look like fox tails. Avoid these varieties and be sure to stick to the traditional, short, cylindrical, pointy needles. The younger needles are best as they are more tender although they soften up when you cook them so don't worry to much about that. I would love to try making these today – they sound amazing! I did some foraging this morning and I think I found some type of pine, staying away from ones that you mentioned, but it does not technically have “needles” – it is the softer type. Does this still work? It doesn’t smell like pine. It tastes good, but more like spearmint than pine. Without seeing the tree or needles it’s really hard to say. As long as you are sure it is a pine tree and the needles are edible then I’m sure a spearmint kind of flavour would work. So, the flavor is absolutely amazing! I loved going out into the woods to pick pine needles, it felt quite fairytale like. My only issue with this recipe is that the dough was literally melting in my hands. I moved quite quickly when rolling it out and by the time I had cut the shapes it was too mushy to pick up. I popped the dough in the fridge for a few minutes and tried again with the same result. I ended up just spooning balls of dough on to the cookie sheet and baking them that way. It worked out, I followed the recipe exactly so I am just curious if you had any suggestions for me? I can’t figure out what I did wrong! I totally agree about it being fairytale like to go foraging for pine needles. It really adds to the experience. Much better than just going to the shop! Sorry you had melting issues. Coconut oil does have a low melting point (much lower than butter) so if the oil isn’t really cold and hard before you start, or if the dough is mixed a little too much, or handled a lot with warm hands or made in a warm heated kitchen, or near a warm oven, it will get really soft. There’s no getting away from that. My kitchen is always pretty warm so I usually stop once the dough is made and refrigerate it for 20 mins or so then roll it out and cut them once it’s cold. I have added a note to the recipe about that in case anyone else has issues. So glad you enjoyed them regardless though! That makes perfect sense. I’ll make sure to chill my coconut oil first, then, immediately chill the dough before handling next time, because I will certainly be making them again! My boyfriend just ate 3 cookies in about 10 minutes! I really appreciate your quick response, I just love your blog! I live on five acres of pine ( lodgepole ) trees and I’m super excited to make these for Christmas gifts… Question. I would like to use vegetable oil instead of coconut oil…. Is this doable? To get the best shortbread texture it really needs to be a hard fat that is used so either coconut oil or vegan butter. Liquid oil won’t give the same texture. I also don’t think they would taste quite as nice with vegetable oil. You could try with one batch and see what you think before making them for gifting. I have no idea what quantity of liquid oil you would need as I haven’t tried it so I can’t help with that I’m afraid. You would need to add just enough to make a dough. Let me know how it goes! Thank you so much for including me Francesca! I had no idea that pine needles were edible! You’re right—we have an over abundance of them here in the PNW—I’ll have to “harvest” some next time I’m out in the woods! I have never thought about eating pine needles before but that is such a cool idea! Perfect for the holidays! 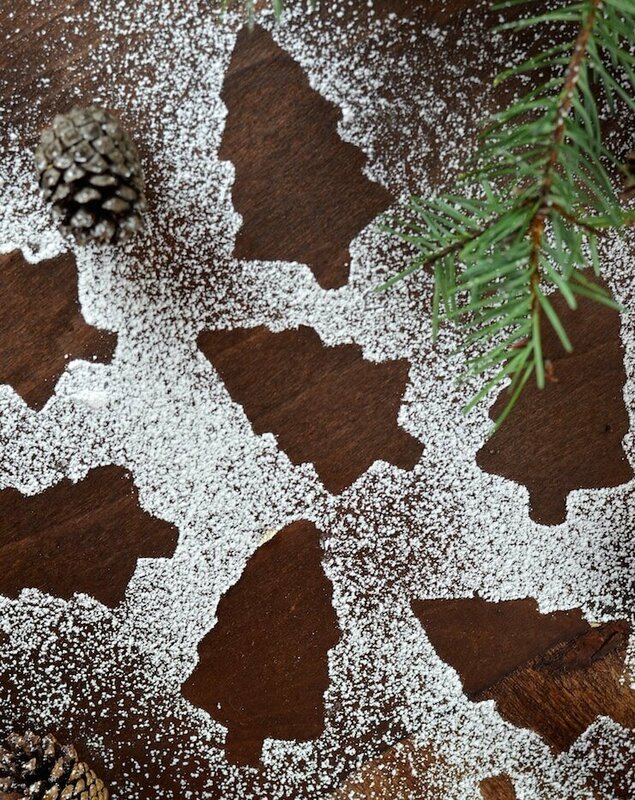 Love the little tree outlines that were left after you decorated them! This is so extremely cool! I can’t wait to get in a forest and taste the pine needles. Love it! The recipe will be in my archives forever. Now this is a fun over-the-top idea! I was actually just sent a recipe the other day that uses pine syrup (they asked me to share that, too, so I might!). I’m just imagining a pine syrup infusion with your fresh pine needles as herbs – could be really unique! Pine syrup on some festive pancakes or waffles would be amazing, or a drizzle cake of some kind with it. Yum! How interesting! I had no idea that pine needles were edible. But it makes sense since they don’t look all that different from rosemary, which is one of my favorite herbs. These cookies are beautiful & so festive! What a wonderful idea! 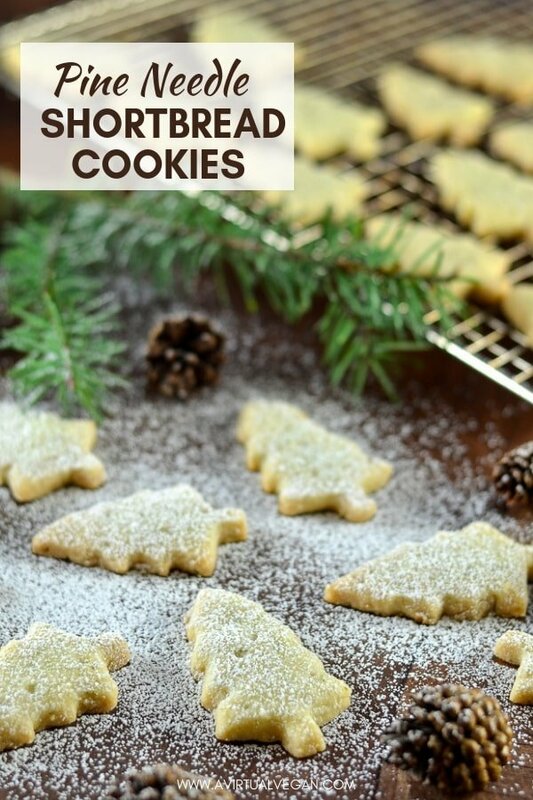 I never knew you could eat pine needles, but I can imagine they add a great flavour to these shortbread cookies. I have plenty of pine needles around my house. There’s even a street in my neighborhood named Pine Needles! I never thought to use them in baking. Aaaawww I would love to love on Pine Needle Street. What a cute name. You need to go foraging especially as you really don’t have to go far at all! What a fun flavor combination! I love earthy flavors in my sweets. Thank you Becky. It’s a mixture of earthy, woody and citrusy. A lovely combo in the cookies! I had NO idea pine needles were edible. Wow! What a delightful little cookie – definitely perfect for gifting or the holiday dessert table!